Eight years ago the Detroit Shoreway Community Development Organization (DSCDO) unveiled a newly-renovated Capitol Theatre. The 1921 theater, originally constructed as a silent movie house, went through years of neglect before ultimately closing its doors in 1985. The huge renovation was complete in 2009, and took nearly 30 years to accomplish. 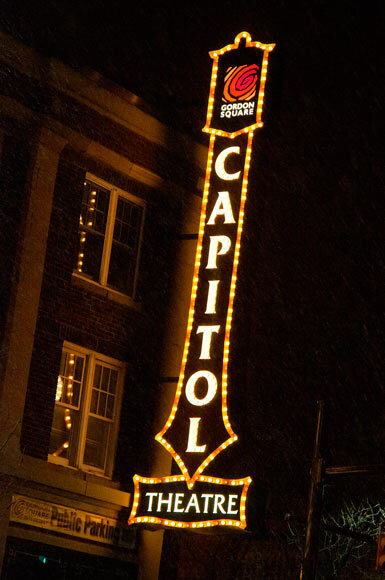 Today, eight years after its grand reopening, the Capitol Theatre needs a bit of an update to keep it going strong for the next 30 years. So the DSCDO is hosting a fundraiser gala, Timeless, on Friday, April 21. The historic theater was already on the DSCDO’s radar when the organization was founded in 1973, and the Capitol was one of the main drivers behind the economic development and success of the Gordon Square Arts District. Today, the Capitol has all digital equipment on three screens and is operated 365 days a year by Cleveland Cinemas. The theater sees an average of 50,000 patrons a year and is a Gordon Square mainstay. Spencer says the Capitol simply needs some upgrades to its equipment, as well as some plaster repair work. “It’s very, very old plaster and it just needs some more love,” she says, adding that previous years of exposure to the elements necessitates periodic maintenance to the plaster. The goal is to raise $70,000 through the Timeless event. Spencer says that amount will cover the digital upgrade and plaster stabilization and restoration, as well as create a repair reserve fund for future upkeep. Friday’s Timeless event begins at 6 p.m. with a VIP reception, with free valet service beginning at 5:30 p.m. The VIP reception includes a silent auction preview and open bar. The main party runs from 7 p.m. to 9 p.m. with cocktails, a large spread of appetizers, the silent auction and a live Hollywood revue performed by local cabaret lounge singer, Lounge Kitty. Desert will be provided by Sweet Moses Soda Fountain and Treat Shop and Gypsy Beans will serve coffee. Tickets start at $100 for general admission and $150 for VIP admission. $83 of the general admission ticket cost is tax deductible, as is $122 of the VIP ticket. Donations to the theater fund are also accepted. All donations will be kept in the Capitol’s fund at the Cleveland Foundation.